For me, the most special part of being engaged was how it made me feel. I honestly didn’t think it would make me feel any different because I was in a truly happy relationship and I wasn’t waiting to “seal the deal." When he proposed it made me so happy. I think the main reason was because we realized that it gave us the right title. We both felt it, even though nothing really changed in our daily lives. We had been living together and were serious about each other. We were in love. But now we could say that we are getting married and that felt right. Being engaged meant it was official and now the whole world could know how we feel. I LOVED LOVED LOVED the ring he picked out for me! It was perfect. It was handmade and custom-designed by a bespoke Canadian jewelry designer – K&CO Bespoke. It is both ethical and beautiful! He picked out a rose gold band with black diamonds all around. Definitely NOT traditional by any means. It looked more like a wedding band rather than an engagement ring, but for me it was the perfect match. I love the black stones – if you have met me you know I only wear black. The funny part was that the size of my engagement ring was “wrong." My fiancé measured all the rings in my jewelry box to get the right size. He made a chart and calculated the Median Circumference from my rings. Then, he ordered the engagement ring based on that. When he proposed, we realized that the ring was too big. It fit perfectly on my index finger (because that’s where I wear all my rings – the ones used to get the “perfect size.") I could have exchanged it for a smaller size, but since that was the finger I like to wear my rings on anyway, I decided to keep it. After all, the "wrong" size worked out very well and made my ring even more perfect! 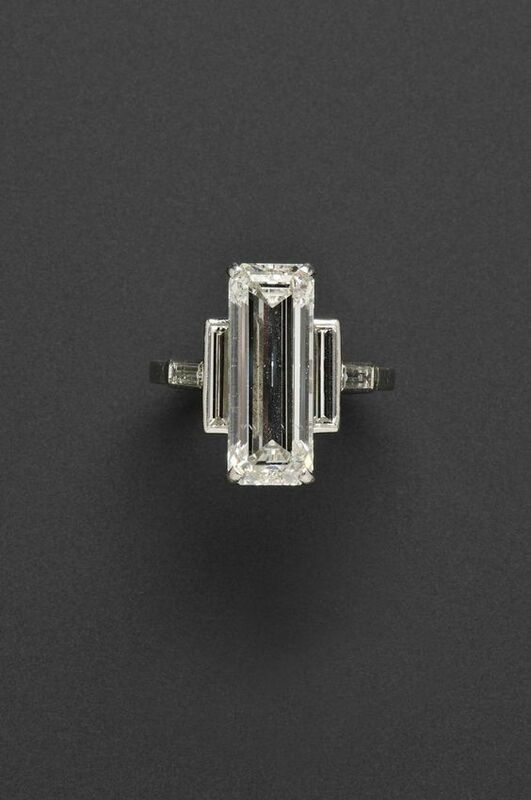 Art Deco If you want a unique ring straight out of the Great Gatsby era, there are many art deco styles available that may just fit your fancy. Raw, Conflict-Free Diamonds Not only do they look cool but you can shine guilt-free, knowing you aren’t rocking any blood diamonds. Moon Goddess For the witchy woman, shop for dark colors, rubies and moons. Black Diamond Black does go with everything. 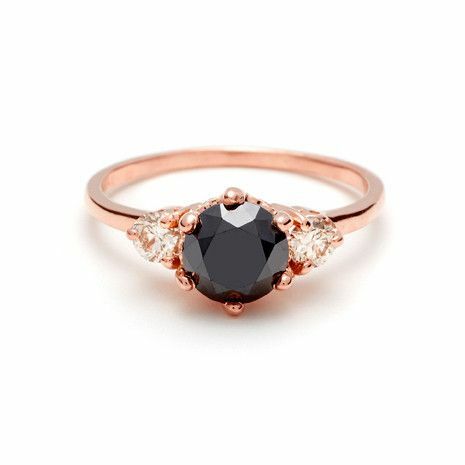 If black is your go-to color, your color, why wouldn’t it be perfect for the ring you will wear your entire life. Black diamonds are rock and roll. Opal Your main stone doesn’t have to be a diamond. There are other stones that are just as dazzling. For instance, the shimmers of an opal. Turquoise To add Southwest flavor, consider some turquoise on your engagement ring. 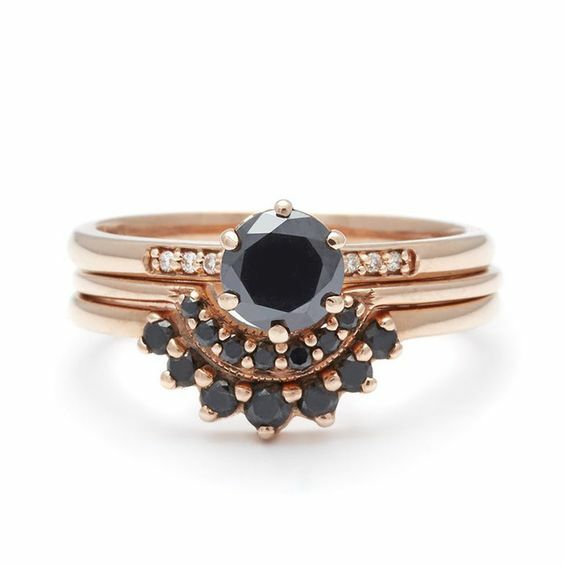 Sapphires don’t just come in blue. They come in an assortment of beautiful shades and colors. One great thing about Sapphire, is that it’s a stone that rates high on the Mohs scale of hardness. No gem is as sturdy and hard as a diamond but Sapphires are also very high up there. They are a 9 out of 10. Visit our Pinterest Board for more Inspiration!